The great source (..) which flows into the aqueduct issues from a spot a little farther on, where are situated the remains of a charming Roman temple, known to the natives by the name of El-Kasha, or the fortress. 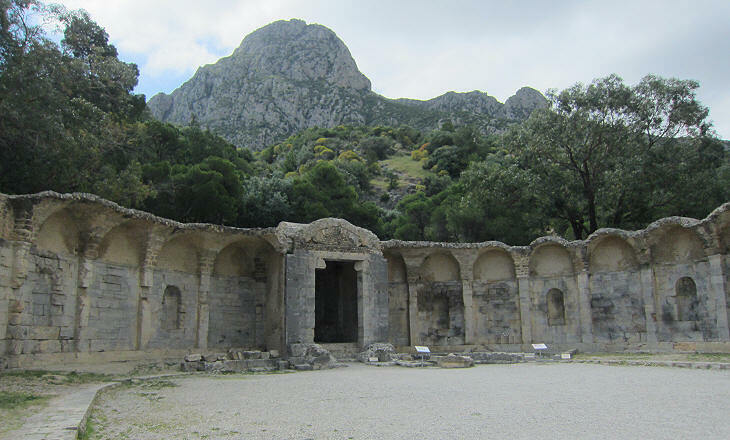 (..) It is situated at the gorge of a narrow and precipitous ravine descending from Djebel Zaghouan, but at a very considerable elevation above the plain at its foot. Excerpt from the 1895 Murray Handbook for travellers in Algeria and Tunisia. Until the beginning of the XIXth century the region surrounding Tunis was known in Europe as Zeugitania, a reference to the division of the Province of Africa into Proconsularis Zeugitana and Valeria Byzacena which was implemented by Emperor Diocletian in 285-292. 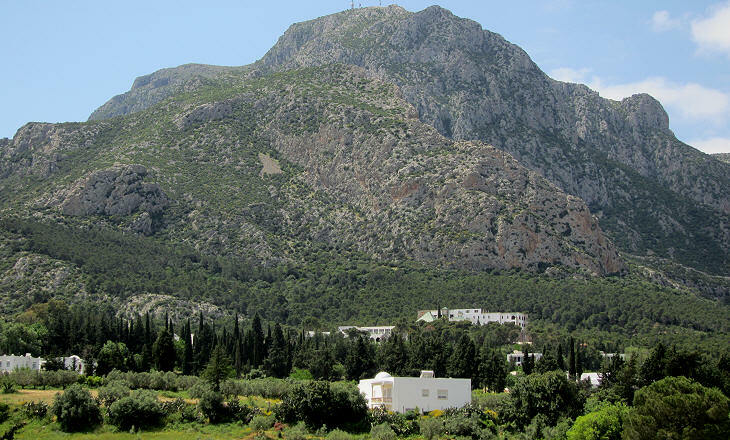 The western limit of Proconsularis Zeugitana was probably placed at Sicca Veneria, near the border with today's Algeria while to the east the province ended at Djebel Zaghouan, an isolated mountain which stands at the end of a plain south of Tunis and which is an obvious landmark as it is visible from a great distance. The mountain most likely gave its name to the new province. 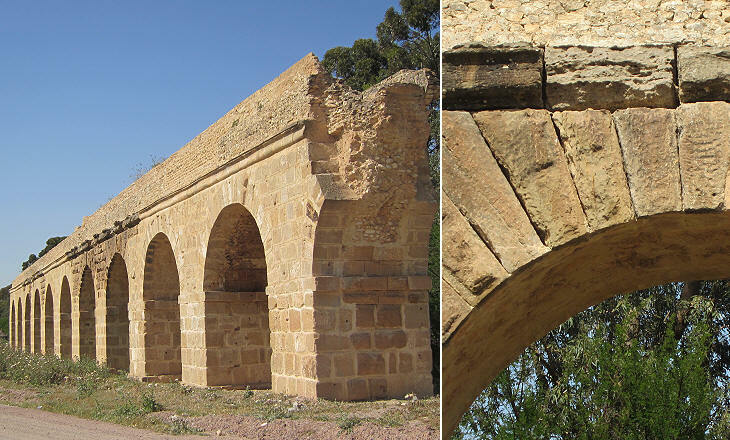 When Emperor Hadrian visited Africa he promoted the construction of a very long aqueduct from Djebel Zaghouan and another nearby location to Carthage. 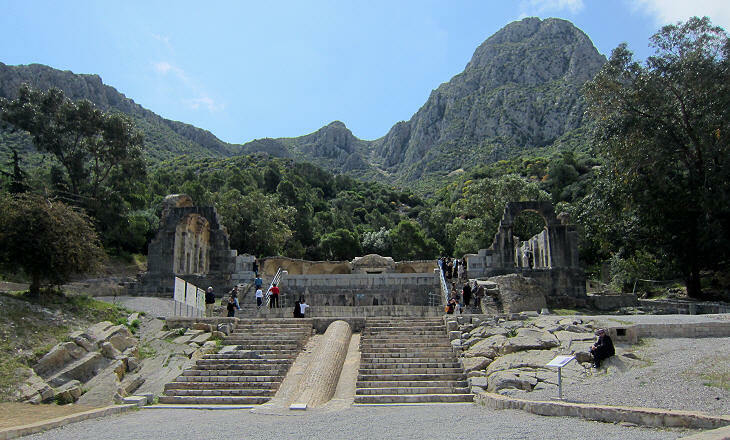 The emperor regarded himself as a talented architect and he might have given instructions to local authorities regarding the gigantic nymphaeum which was built at the beginning of the aqueduct. The building is extremely elegant, and in its original condition must have been one of the most charming retreats which it is possible to imagine. (..) It consists of a paved area of a semi-circular form, but with the two exterior limbs produced in straight lines as tangents. Round the perimeter was a raised colonnade, and at the end, in the middle of the circular portion, was a rectangular cella, which is still tolerably entire. 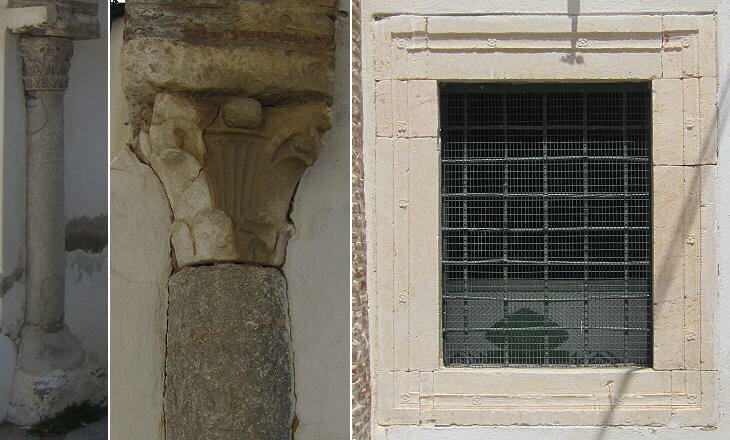 The walls of this latter building are of rubble masonry, but at the extremity there is a niche lined with cut stone, surmounting what may either have been the base of a statue of an emperor or an altar to a divinity. Probably the former, as the mutilated trunk of such a statue, in white marble, and of colossal size, was actually lying on the ground outside at the time of the writer's visit; this has now disappeared. (..) Each end of the side colonnades was terminated by a handsome gateway. (1895 Murray Handbook). Old guide descriptions are often a useful tool when visiting ancient monuments as they assist in identifying additions/reconstructions. It is certain that we have from this eminence a most delightful and extensive prospect which might therefore be the place from whence Agathocles (IVth century BC tyrant of Syracuse) was entertained with the view of both the country of the Adrumetines (today's Sousse) and Carthaginians. The small horseshoe pool had only a decorative purpose. 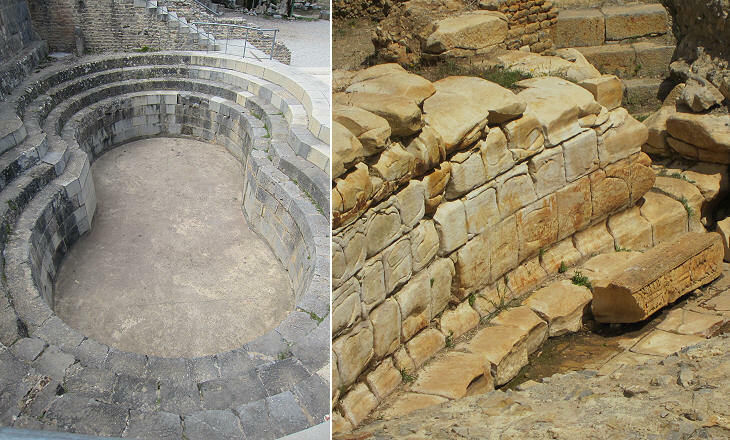 The water of the spring was carried to a large oval pool from which it started its journey to Carthage. 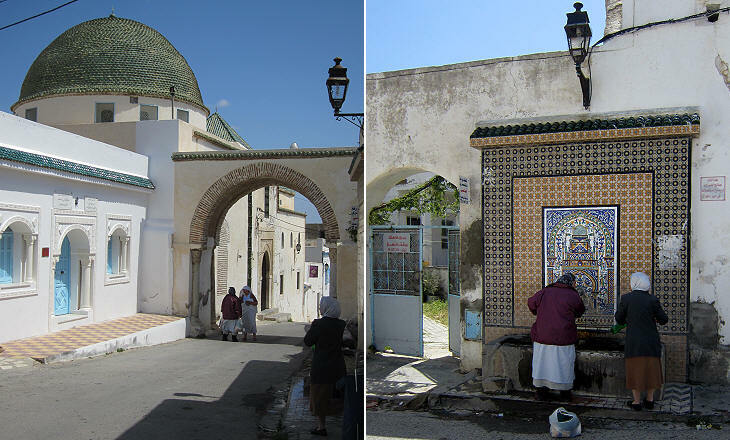 The aqueduct was restored several times by the Arabs and after them by the Ottomans to supply Tunis, rather than Carthage. It is still possible to find sections which show the stones of the Roman period. 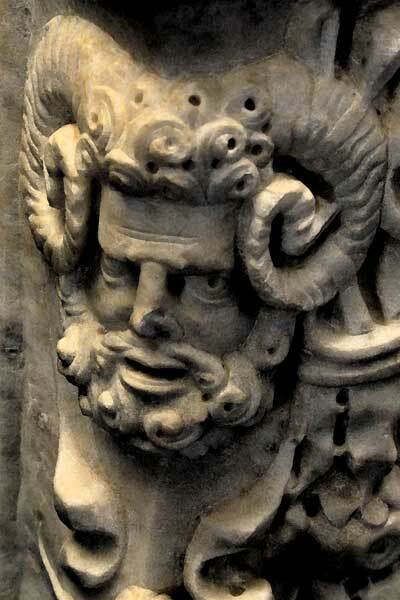 Upon an ancient gate there is a ram's head, armed, in basso relievo with AUXILIO, in large letters below it. This may perhaps instruct us that Ziqua was under the immediate influence and protection of Jupiter Ammon. From Travels or Observations relating to several parts of Barbary and the Levant by Thomas Shaw - 1808. 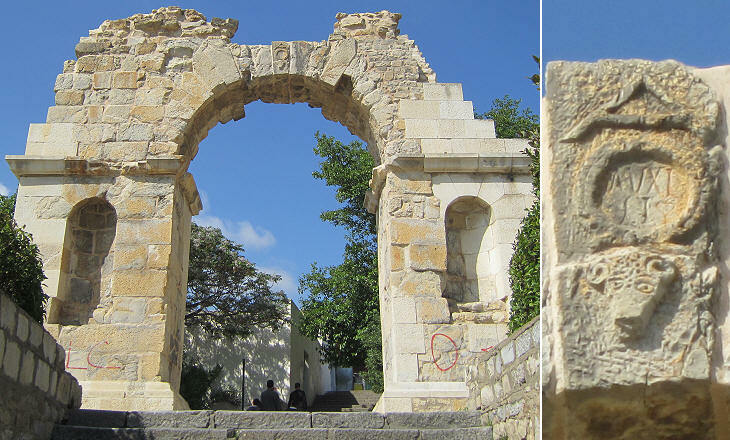 Today the arch has a rather modern appearance, but Shaw's account confirms that the key stone is original. Ammon was the god to whom a famous oracle was dedicated at Siwa, an oasis in Egypt, near the border with today's Libya, which was the easternmost outpost of the Berber people, the native inhabitants of north-western Africa. After Alexander the Great asked the oracle whether he would conquer the entire world and received an affirmative answer, Ammon was associated with Zeus and Jupiter and entered the Greek and Roman pantheons (you may wish to see a better image of Jupiter Ammon in a funerary monument found in Sardinia - it opens in another window). A less elaborate theory suggests that the relief represents a capricorn's head, a symbol of Legio III Augusta, the Roman legion which was stationed in Africa, and that the gate was built by the auxiliary troops of that legion. 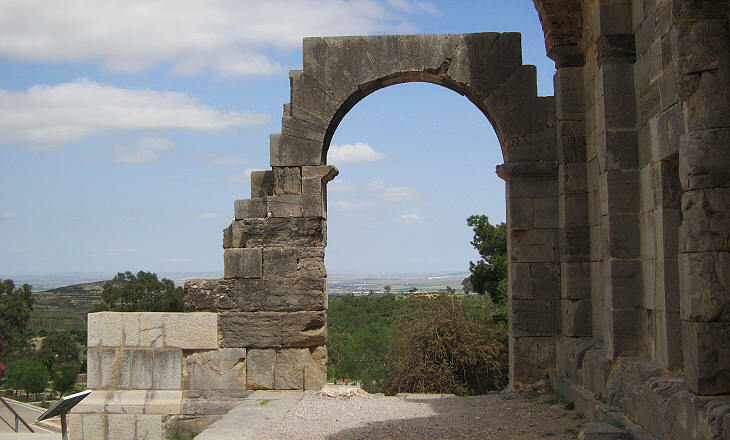 The gate is the only remaining monument of ancient Ziqua, the town situated a mile from the nymphaeum. The site was probably abandoned until the XVIIth century when Muslims expulsed from Spain settled there. They were called Andalusians, but they actually came from all regions of Spain. They were farmers and had knowledge of irrigation practices which they utilized at Zaghouan. The 1895 Murray Handbook depicted Zaghouan as follows: notwithstanding its exceptionally favourable position and the abundance of its water supply, it appears to be falling into decay; half the houses are ruined and there is no appearance of any modern construction going on. 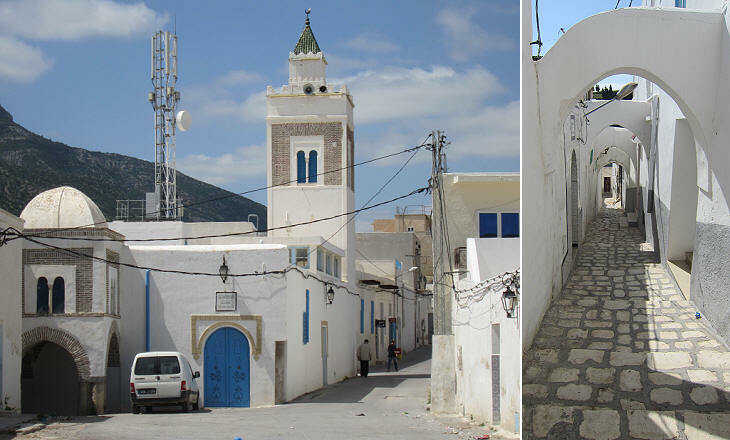 Today the town is a popular excursion site for the inhabitants of Tunis and it is tidy and full of life. Its water is believed to have several beneficial effects either drunk or used for bathing. According to tradition it increases the chance of becoming pregnant.